First edition of Kennedy’s Pulitzer Prize-winning work. Octavo, original half cloth, with eight pages of black-and-white photogravures. Foreword by Allan Nevins. 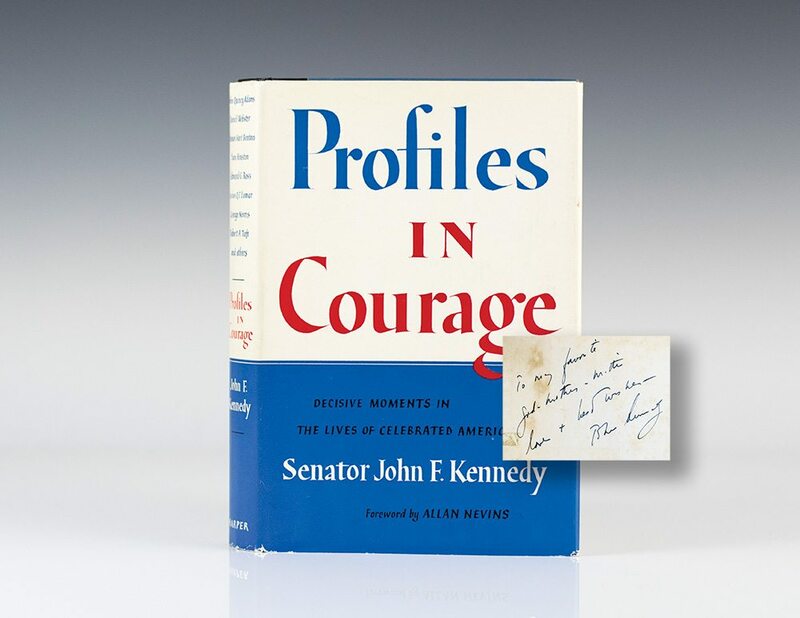 Inscribed by the author on the front free endpaper, “To my favorite God-mother with love and best wishes- John Kennedy.” The recipient was John Kennedy’s paternal aunt and godmother Loretta Connelly. An excellent example with some offsetting to the endpapers in a near fine dust jacket with some rubbing to the extremities. Jacket design by Phil Grushkin. Housed in a custom half morocco clamshell box. Familial association copies of Profiles In Courage seldom enter the marketplace. An exceptional inscription, most rare and desirable. The Pulitzer Prize-winning book was written when Kennedy was the junior senator from Massachusetts, and it served as a clarion call to every American. The inspiring accounts of eight previous heroic acts by American patriots inspired the American public to remember the courage progress requires. Now, a half-century later, it remains a classic and a relevant testament to the national spirit that celebrates the most noble of human virtues. Kennedy relates these heroisms to sketches of American politicians who have risked their careers for principle. "A man does what he must," he wrote, "in spite of personal consequences, in spite of obstacles and dangers and pressures-and that is the basis of all human morality."